These Entry Boxes Include a Metal Locking System to Stop Tampering! These Ballot Containers Are Comment Bins That Attach to the Wall! These Entry Boxes Are On Sale Now! Quickly screws into the wall! Metal lock on top for security! Made of sturdy, clear acrylic! 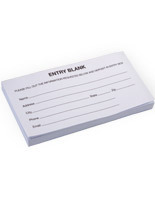 These entry boxes are perfect for all professional or promotional needs. People are able to hang the ballot bins in view for patrons to see. 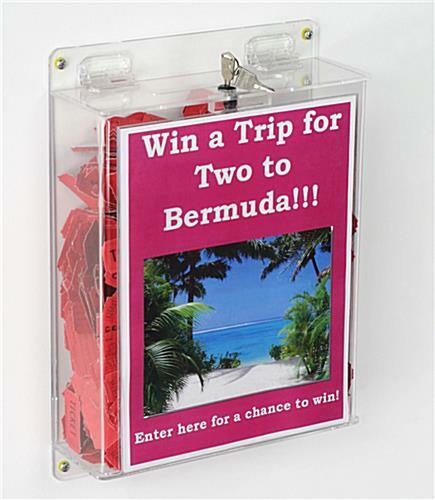 These entry boxes can be used for contests, sweepstakes, or any other promotional events you are conducting! 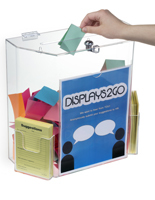 Acrylic comment containers are simple to display and use. These entry boxes are simple to set up as all you have to do is screw into the wall. The ballot bins come with a built in sign holder in the front which is 8 ½" x 11". 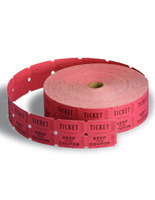 These entry boxes, also called comment containers, feature a sign that is simple to create using any word processing software. The ballot bins make it so you don't have to spend extra money being limited to one program. 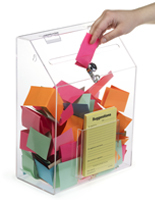 These entry boxes are made of sturdy, clear acrylic so you can see what has already been submitted. The comment containers are manufactured with a metal lock so that the entries cannot be tampered with. These entry boxes come with the mounting materials you will need. 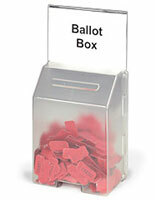 The ballot bins are a professional way to conduct a contest or any promotional event. 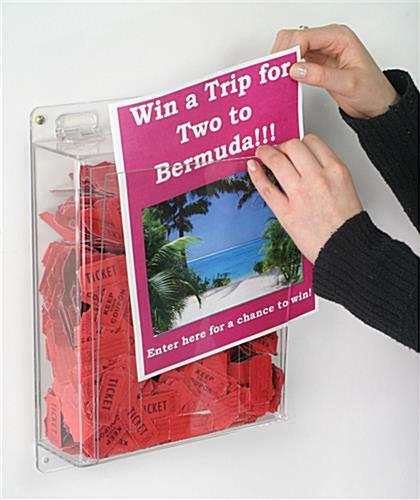 These entry boxes can also double as a sweepstakes collectors in any environment. 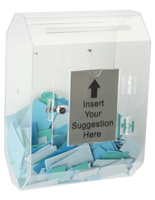 Prompt your employees to provide feedback about the workplace in the ballot bins so they can give you their honest opinion while remaining anonymous. These entry boxes can be used for a wide variety of events to suit your every need! 17.4" x 14.3" x 4.8"